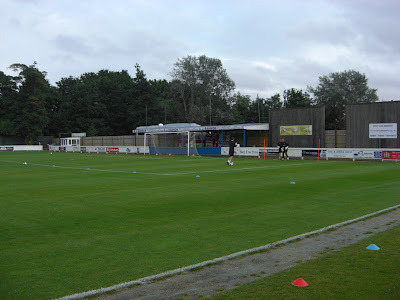 My twentieth stadium of 2011 was on Monday 28th March 2011 at Ram Meadow in Bury St. Edmunds, Suffolk. The match was Team Bury vs. Long Melford in the Ridgeons Eastern Counties League Division One. Placed half a mile from Bury St. Edmunds railway station, Ram Meadow sits just to the east of Bury St. Edmunds town centre. 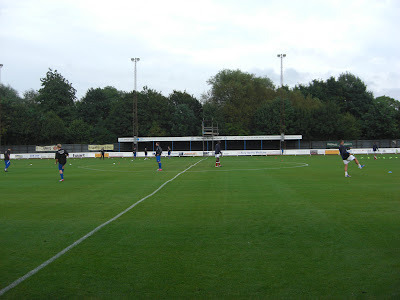 The ground has been home to the club since they formed in 2005 with Bury Town having played there since 1978 after moving from their former ground at Kings Road. Team Bury groundshare with their parent club Bury Town who currently play in the Isthmian League Premier Division and some of the photos in this report are taken from a later game involving Bury Town. 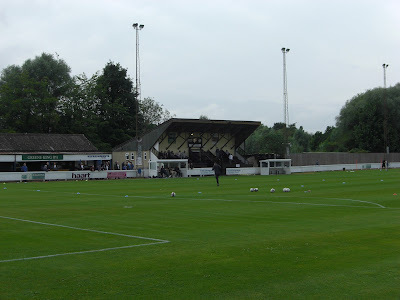 The ground has one seated stand level with the half-way line on the western side of the venue which consists of a few rows of wooden benching and also contains the players dressing rooms. Next to this is the clubhouse with a covered standing area in front of this. On the opposite side of the ground sits the Jimmy the Rattle Stand - one of the four covered standing areas in the venue. The remaining covered standing areas are located behind the goals at the northern and southern end of the ground with the southern end of the ground backing onto a large car park and the northern end of the ground in the shadow of the nearby sugar factory. This was a game two sides who were towards the bottom end of the Eastern Counties League Division One. Team Bury, largely made up of young players drawn from the West Suffolk College Football Academy, put in a decent performance on the night to record a 2-1 victory over Long Melford.